Breakfast is the most important meal of the day, but between getting ready for work and getting the kids out the door, there isn’t much time left to whip up something healthy and hearty. From supercharged oats to tropical smoothies, these bowls are brimming with nature’s bounty—fruits, veggies, grains, seeds, and nuts—to fuel you for the day ahead. The acai bowl is a tried-and-true favorite. This very berry version from Simply Lakita blends banana, mixed berries, acai, and protein-rich Greek yogurt. 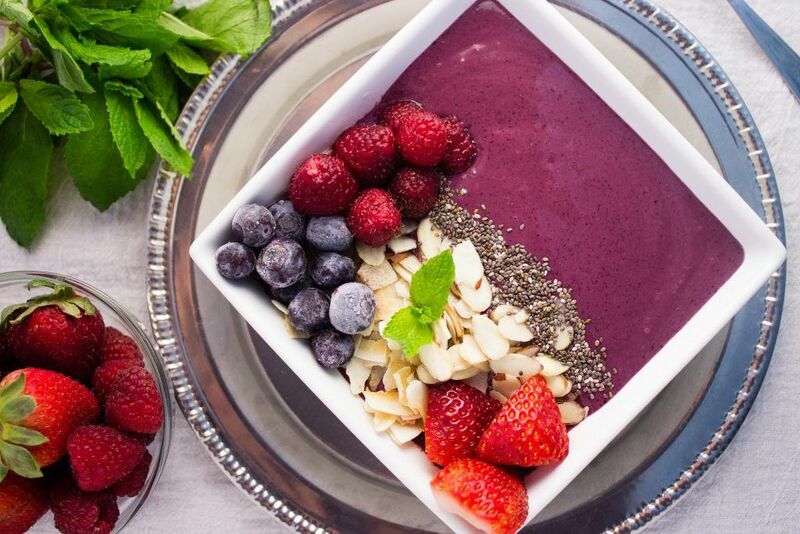 More berries, chia seeds, coconut flakes, sliced almonds, and fresh mint provide the finishing touch. There are so many things you can do with quinoa, and this five-ingredient breakfast bowl proves it. Sweet blueberries, vanilla, and a little bit of sugar or honey come together for this simple and perfectly tasty bowl. Savory, spicy, and oh so satisfying, this breakfast burrito bowl from Yup it’s Vegan is made with pan-fried chickpeas, black rice, lentils, quinoa, guacamole, cabbage, and mango salsa. One bite and you’ll be hooked. Pressed for time in the AM? Try this delicious, make-ahead chia and flax pudding from Wellness With Taryn. In the evening, combine chia and flax seeds and coconut milk in a mason jar and refrigerate overnight. In the morning, it’s ready to serve. Jazz it up with chopped prunes, toasted coconut, sliced kiwi, almonds or whatever toppings you have on hand. The star of this plant-based breakfast from Planes to Plates is definitely the mango. This tangy treasure gets a flavor boost courtesy of pears, pecans, coconut, almond milk, and chia seeds. A banana split for breakfast?! Eating Bird Food's dessert-inspired dish is vegan and gluten-free and bound to be embraced by the whole family. Don’t worry—it still delivers on the sweetness of the original, courtesy of dairy-free yogurt, caramelized bananas, fresh berries, cacao nibs, and grain-free granola. Channel your inner mermaid with this under-the-sea-inspired smoothie bowl from Create.Nourish.Love. Superfood spirulina—a type of blue-green algae that's an excellent source of vitamins, iron, manganese, beta-carotene, and protein—lends a lovely seafoam color and an abundance of nutritional benefits. Oatmeal is heart-healthy and full of fiber to help you stave off mid-morning snack cravings. 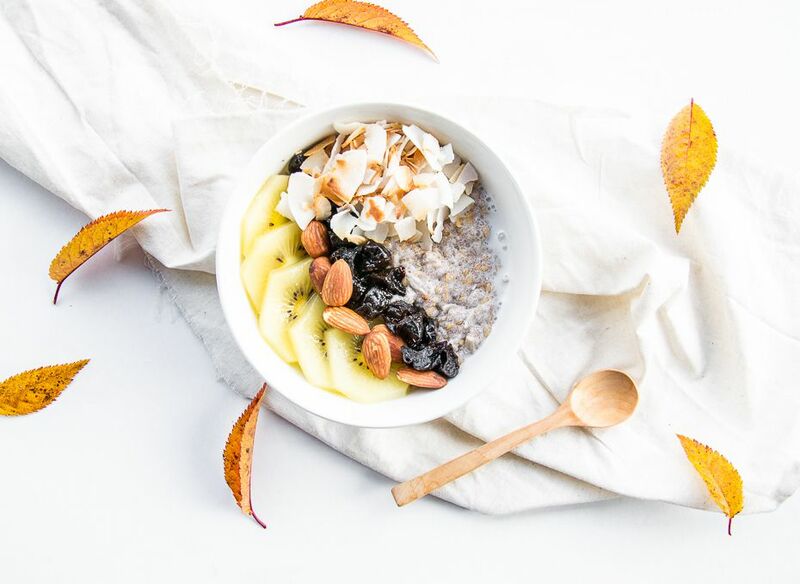 This superfood oatmeal bowl from Fresh Fit Kitchen is loaded with protein, courtesy of hemp seeds and almond butter. And the blueberries pack an antioxidant punch. Love juicy peaches? Oh My Veggies found a way to enjoy them year round. Slice and freeze them to preserve their peak freshness. Whenever you’re longing for a taste of summer, simply blend them with coconut milk for a seriously creamy smoothie and top with more peaches, almonds, and raspberries. Love PB&J? Cali Girl Cooking gives this nostalgic childhood classic a grown-up makeover. The combination of protein-packed quinoa, unsweetened cashew milk, honey, peanut butter, strawberry jelly, sliced banana, and slivered almonds is guaranteed to delight your taste buds and jump-start your day. If you like tofu scramble, you’re going to love chickpea scramble. It’s a particularly delicious addition to this breakfast bowl from Kale Mary that also stars turmeric, pomegranate seeds, sweet potato, sesame-crusted avocado, and roasted cauliflower.